If not Death, at least Major Reconstructive Surgery in Venice. Much has been written about the sale of the Venice, California post office. I'll leave you with these two articles at Save the Post Office for more information about the progression of this story. Today I thought I'd leave you with a couple of photos of this stately building taken early September 2012. The Venice post office was consolidated into its carrier annex -- only several hundred feet away in this instance, but quite far in others. From a distance the building looks alright. You've got two distinct (white atop yellow) colors of paint, red Spanish tile roof. The entire property is surrounded by a covered fence that's slightly more than six feet tall. NO TRESPASSING, signs declare. If you can peek your way through a gap in the fence, you can bear witness to the fact that the entire landscaping being torn up. The stairway at the front of the building has been stripped away, and the lighting fixtures have been removed. One guesses they'll be back in the future. Read the sign closely on the door, and it declares -- to no one, now -- "Customers pleased be advised that you can pick up your new PO Box and new keys at our new location ..."
And, here's a wider look. The new location is the former carrier annex at 313 Grand Avenue. While not far from the old Venice post office, it is further from the commercial district than its predecessor. 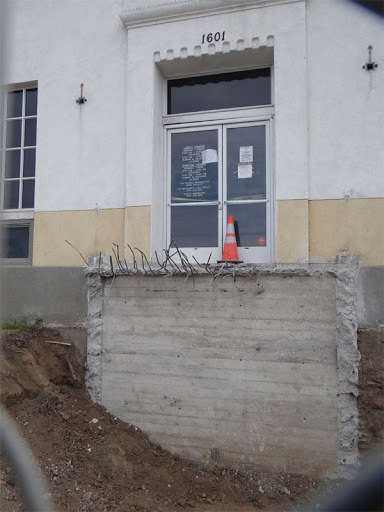 A sign at the back entrance to the building declares THIS FACILITY IS NOT OPEN TO THE PUBLIC. The front, fortunately, is more customer-friendly, if nearly completely devoid of character. Inside one is greeted with new POS layouts, with rounded blue counters atop "naturally colored" plywood -- more inviting than the blue-atop-white layouts at most offices. Still, I'd have preferred the site with character. Glad I was able to get pictures a year and a half ago. This makes me sad. I saw the piece on Save the post office. It's a shame to see the building in this condition.